There has been a trend over the last few years to revive the slow burn of horror films. Films such as The Babadook, The Witch, and It Follows create an atmosphere laced with tension that slowly builds towards an inevitable and bloody release. Hereditary follows this trend, and is perhaps even a bit more painstakingly cautious with the way it slowly builds. However, by the end of the film you are left stunned and physically shaken by the emotional and gory climax. Hereditary is one of those films that has a mystery at its heart, and unlocking that horrific secret is part of the effectiveness and joy of it. Hence, going in with as little foreknowledge as possible is for the best. Suffice to say that with the death of her somewhat estranged and enigmatic mother, Annie (Toni Collette) begins to feel strangely haunted by her past, and unlocks some secrets that impact on her daughter (Milly Shapiro) and son (Alex Wolff). Director Ari Aster exercises extreme care here, with an attention to detail and minutia both in the construction of the script and the composition of the shots. Hereditary also has a strong reliance on physical effects, which are appropriately and sparingly used. Instead of gore or the traditional jump scares, sound is often used to disorientate the audience and increase anxiety; a technique that is oddly effective. It’s an old horror trick to break that moment of tense silence, and it’s already been used well this year in A Quiet Place, but here it is elevated to new heights of effectiveness. Hence, you always feel that there is a presence lurking in the corners, biding its time. This is the core of Hereditary; the fact that there is an invasive presence lurking in the family house. Psychologically that is grief, that sense of sorrow and the guilt of those that have survived and are mourning. It is a force so powerful that it drives the family to conflict, splintering minds and familial bonds. Of course, being a horror film, there may be something even more sinister at its heart. Toni Collette gives a brava performance as a wife and mother pushed to the brink of madness and desperation, haunted by aspects of her own past, and questioning her sanity. Mily Shapiro brings an extraordinary look and unsettling feel to the young daughter, Charlie. She is more than just another iconic creepy kid in a horror film, but brings a deep sense of ambivalence to the role, leaving the audience questioning what is happening to the character. Alex Wolff also does marvellously, building on what initially appears as a support role into something increasingly tragic and fragile. 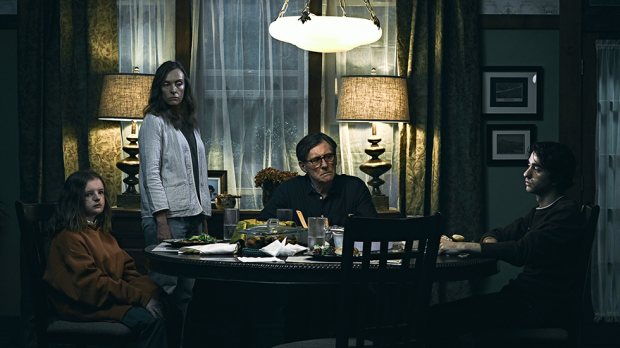 Hereditary is never quite the film you think it is going to be, as it is filled with constant surprises, ready to shift audiences’ expectations and collapse the ground from underneath them at a moment’s notice. It is thoughtful and intense, rewarding patience as it slowly builds to something wondrously horrific. This is a movie that will haunt you, and may well stand as a modern horror classic.